Your Window on Money seeks to address topical issues that are likely to be of interest to most readers; please do not hesitate to contact us should require further information on any of the articles, or any other financial matter. The information contained within our newsletters is for information purposes only and does not constitute financial advice. Does your money need a personal trainer? // Single adults find it hard to save // How to side-step retirement remorse // Self-employed? 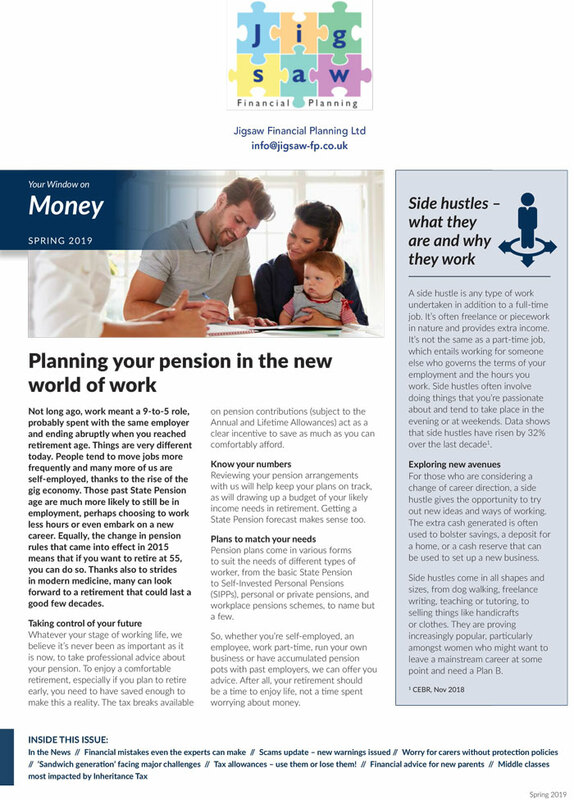 Prioritise your pension in 2019 // Poor health prompts retirement // Pensions – there’s good news! // Make 2019 the year you get the protection you need // Time to top up your ISA? Is your family financially-savvy? // In the News // What are the main asset classes? // Seven out of ten pension savers favour retirement income targets // More taking out protection policies as health consciousness rises // Reached your half-century? How to plan for retirement // Adults carry out 109 life admin tasks per year // Women are better savers than men. · Are millennials saving enough for retirement? · Where will you live in retirement? · Do we need targets to help us save more for retirement? · Pension freedoms – don’t lose out! · Does it make sense to combine your pension pots? · Junior ISA – cash or stocks and shares? · How much will you spend in retirement? · Will Brexit derail pension freedoms? · Annuities – where are we now?